Earlier this week I was lusting insanely over $40K worth of camera gear. Today a cosmic ray stuck my brain from a completely different angle-- I decided that I needed a pinhole camera Right Now. A normal person would get some film and an oatmeal can and go to town the old-fashioned way. I am not normal, no sirree. My idea of a pinhole camera involves a scrap of aluminum foil, blue masking tape, and a few kilobucks worth of Canon camera gear. Mine is not to question why, but merely to obey the voices in my head. I sacrificed a body cap, dremeled a fairly small hole in it, taped some foil over the new opening, and made a pinhole in the foil. Easy peasey. I call this composition Still Life With Crap Found On My Kitchen Counter. It's straight off the camera, except that I corrected the far-too-yellow white balance. I think it's not too bad for a first effort. I've got a similarly prepared Nikon body cap. I need to try it on the D700; maybe it'll look better at 12MP than it did at 6MP. What I really need to do is prepare a lensboard for the 4x5 (I do still have one film camera) and try THAT. A zoom pinhole camera with tolerable resolution! 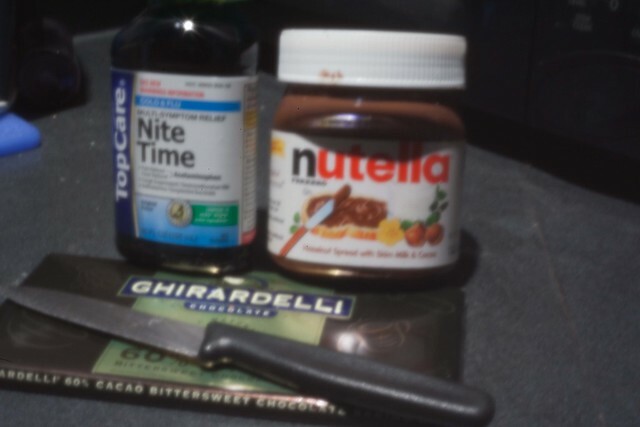 also, cold medicine, chocolate, nutella, and a knife? you *do* know how to party. I don't know, without the curved image you get from the oatmeal can I'm not sure it's the same. The neat thing about pinhole cameras is the (nearly) infinite depth of field, giving pictures with both the foreground and background in sharp focus. I'm guessing you knew that even though your test photo doesn't take advantage of it.